Is Easter all about chocolate eggs for you? Do you celebrate the real reason behind Easter? Or a combination of the latter two elements that comprises the celebration that is Easter in Sydney? Looking forward to hearing from you on how you're going to spend Easter this year. For me Easter is always about family. Whether it's my immediate family, or an intimate lunch with my fiancé the idea is to feast together and share some chocolate afterwards. Growing up we would have lamb but I don't do that anymore. 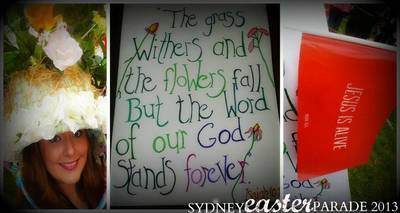 When I visited family here in Sydney we always went to Church then did the same - a huge feast with extended family in the stunning garden - where an easter egg hunt happened. The kids have to get an easter egg hunt no matter what! Our tradition (between my fiancé and I) has become just one Lindt classic bunny given on Easter, and one year we went away to the Hunter Valley (highly recommended) - otherwise it really gets too too much! Another thing that is tradition in the area I come from, Byron Bay, is to go to the Blues Fest happening over Easter weekend. Also a great celebration. Best place to buy greeting cards in Sydney? Best place to buy pets in Sydney? Best chocolate shop in Sydney?